Traction inverters technical solutions are based on high-performance vector control in custom designed VONSCH ac drives. Power supply can be solved from both the batteries or DC trolley line. We also have rich experiences with ATEX certified drives and power electronics . 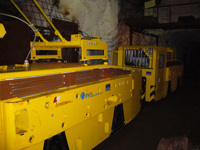 Our most frequent traction drives applications are the drives for mining locomotives. The traction drives including auxiliary drives, accessories and control system are designed and produced according to the requirements of the customer. Please, do not hesitate to contact our sales department for more information. VONSCH s.r.o. is European company from Slovakia, offering cutting-edge solutions in the area of industrial and power electronics. The company specializes on custom solutions of AC drives, renewable energy sources and special voltage supplies. Watch our latest video about our custom solutions of power electronics.